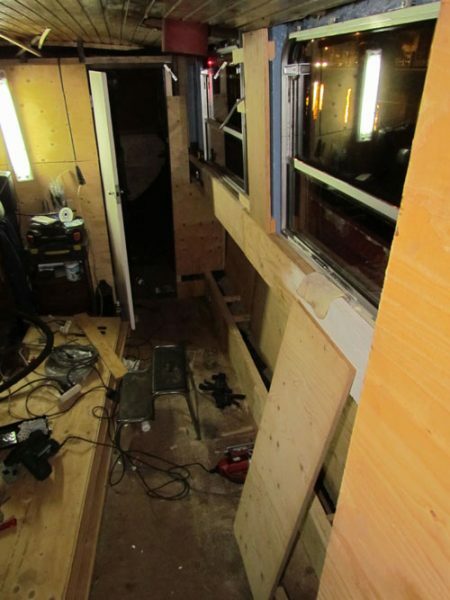 31st October 2011 – It is now starting all over again, cleaning the hull, drilling holes, building a frame, putting insulation, …. I’m now working room by room, but it is often getting boring as well! 30th October 2011 – I was in Kortrijk to help a friend. I took some time to have a look at the boats in Kortrijk. I forgot my camera aboard so I used my phone to take some pictures. The quality is not good! 29th October 2011 – Since I’m only planning to put the t&g wood in April next year, I decided to paint the sheets of multiplex in the living room. It makes it nicer to work and to have my coffee! 23rd October 2011 – The other side of the living room was planned for today. It took me some time to figure out why there was a 20cm difference in the starboard side of the living room. It was only in the late afternoon I discovered the error I made. This means I lost a lot of time. By the end of the evening, I made some progress. 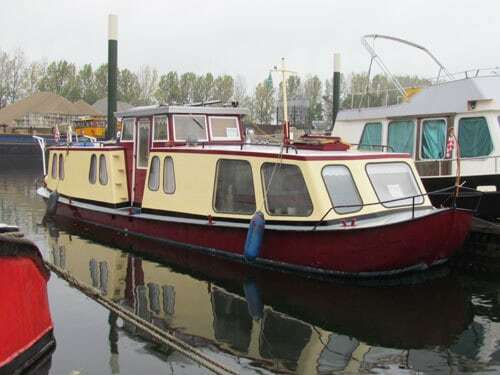 22nd October 2011 – I have now owned the boat since April. Ever since, I have always put more stuff on the boat. Things I found or got, tools and pieces from my other ship, I filled it up in less then seven months. 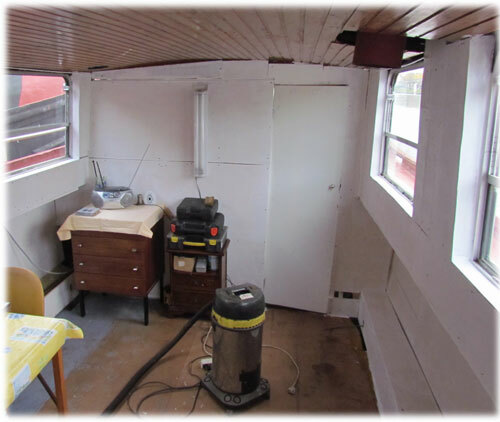 The bathroom area was cleaned in the morning, the wheelhouse in the afternoon. The ship is looking much bigger again. I removed the kitchen unit, which wasn’t working anyway. 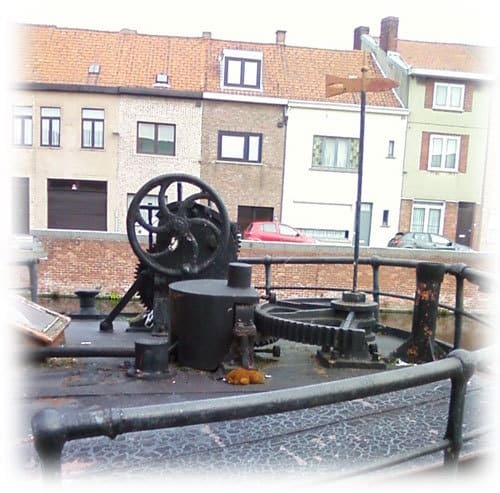 22nd October 2011 – I have been working all day on the Hornblower. I was surprised to see how many boats passed by, knowing the season is over. One of them was a nice klipperaak from Boezinge. Sadly enough, I was to late to take a picture. In the evening, their was a small concert of a band on one of the boats. I enjoyed it very much. It is sometimes great to be on a boat without having to work or talk about boats in general. Thanks Anna for the invitation! 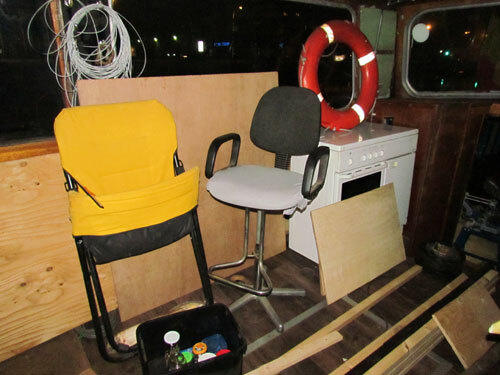 20th October 2011 – I mounted the wooden frame against the ribs of the boat. I gave the metal a second coat of paint. It is now ready for insulation. The yellow paint is from International and was intended for the Ross Leopard. Since the ship was scrapped, I got the paint and I’m using it whenever I can. 18th October 2011 – Finishing the other side of the living room is the plan for this week. It all starts with drilling holes! 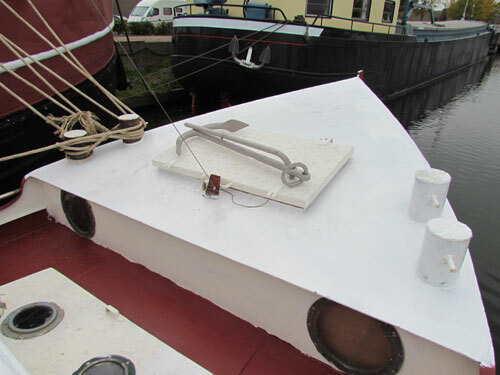 15th October 2011 – The roof received a second coat of paint. It might be the last nice day before the winter will start. In the morning I ran the engine, but it does not make a change. The gearbox needs a service! 14th October 2011 – I went buying some more insulation. In the afternoon, I did a quick paint job. 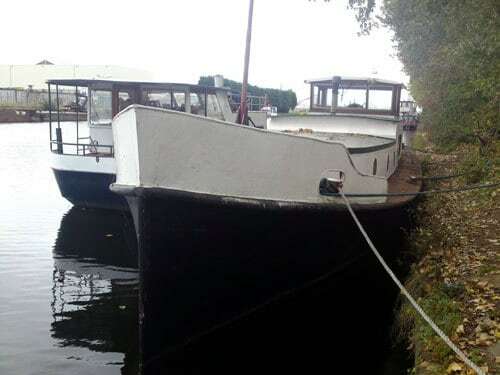 The Hornblower is looking much better now! 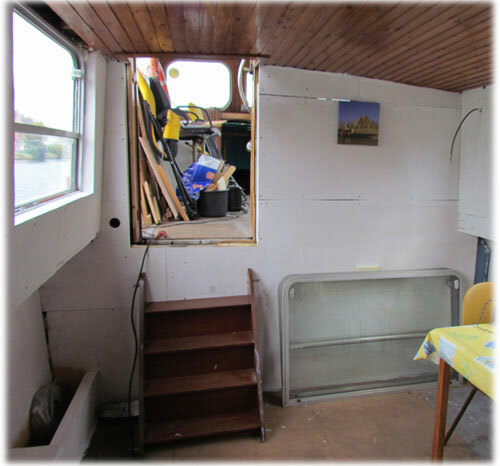 12th October 2011 – I continued insulating the boat. I did the gang boards. 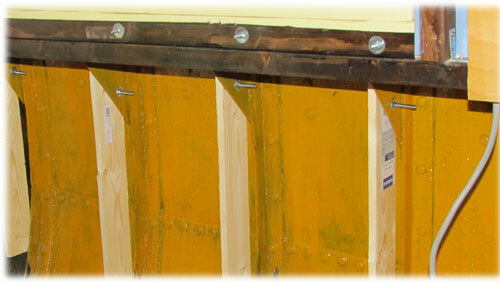 The side panel was mounted, as well as some other wood. It looks more finished now. At the end of the evening I drilled the holes for the electricity sockets. Since I’ve ran out of insulation, I’ll have to wait till Saturday. 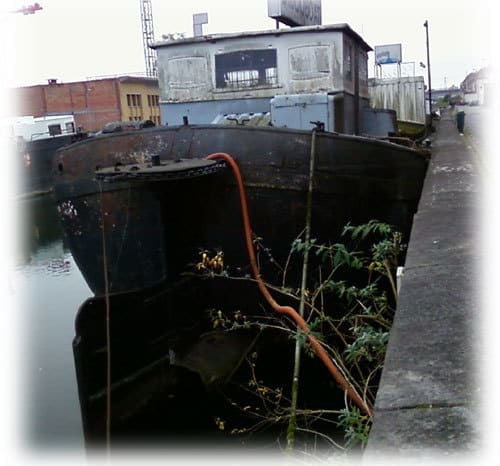 11th October 2011 – Another visit of a barge was planned for this evening. 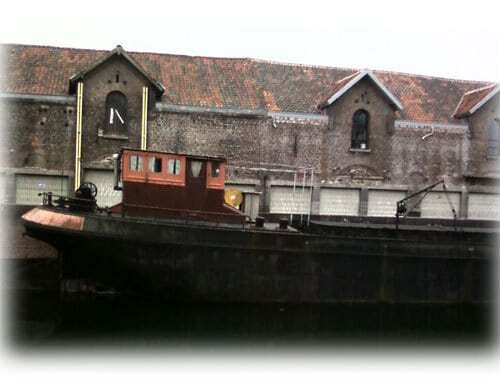 I knew the boat, since it has been moored in Sluiskil for three years. My best friend lived on it, after he had done the conversion. This ship was built as the Java in 1928. 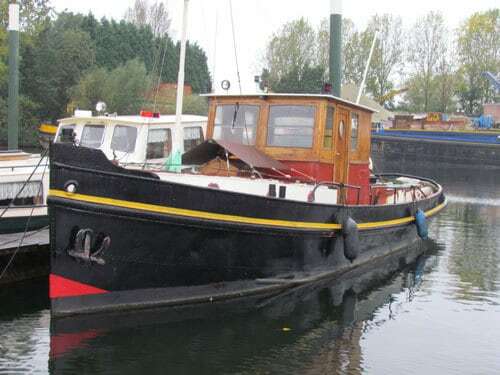 She was used as a tender to bring crew to the larger passenger vessels in the big harbours. 9th October 2011 – I often join people to have a look at a ship. Today I went to Tilburg (Netherlands) to visit a Friese Praam of 14 meters. It was the first time I was in that area and found some very nice vessels. 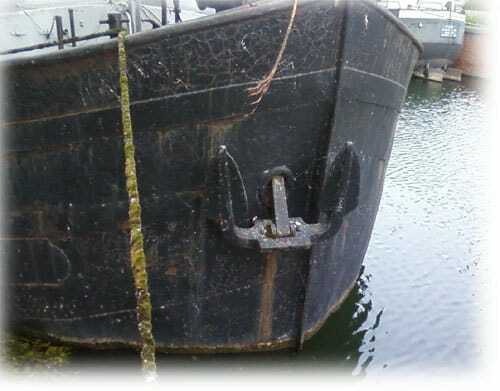 The vessel itself seemed very nice and in a good condition. I was surprised to see how much space was created on such a small surface. Friendly people, a beer and a good chat. 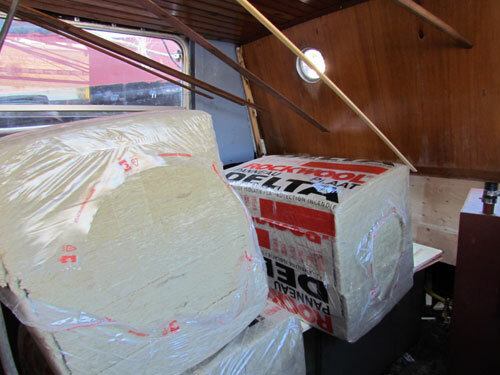 8th October 2011 – In the morning I bought some insulation for the Hornblower. I use Rockwool Delta Sheets. Easy to work with and you can put it against the metal of the ship. 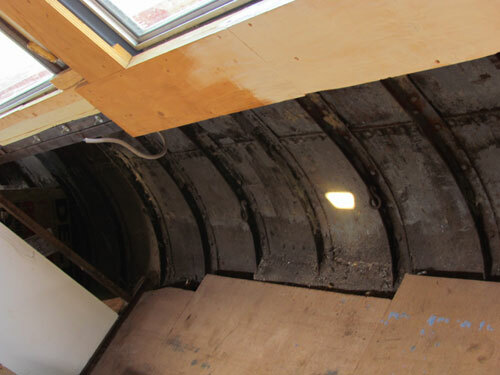 4th October 2011 – I drilled some more holes in the ribs of the boat.